A young Montgomery County, Pennsylvania, cancer patient who was blessed by Pope Francis during his Philadelphia visit, has died. "It saddens us to have to say this but our precious son Landon, went to live with God Saturday evening. We will miss him dearly but are glad to know he is finally healthy and happy sitting next to our Lord. Landon was an intelligent, funny and loving 9 year old that touched many in his short time. He fought valiantly for 5 years. We don’t know anyone tougher or braver than him," the family wrote. Landon, who turned 9 on Thanksgiving Day, was scooped up from the crowded sidelines during the pope's Sept. 26 procession to Independence Mall. Pope Francis reached out, gently cupped Landon's head and kissed the frail boy, who wore his Batman T-shirt that day. Landon's father, a Spanish teacher at William Penn High School, said his son was in a good position that day to see the pope come by, but there was no a guarantee he'd be selected to meet the pontifex. As the Popemobile approached, Ariel Vargas kept saying, "Bendicelo!" which means "Bless him!" 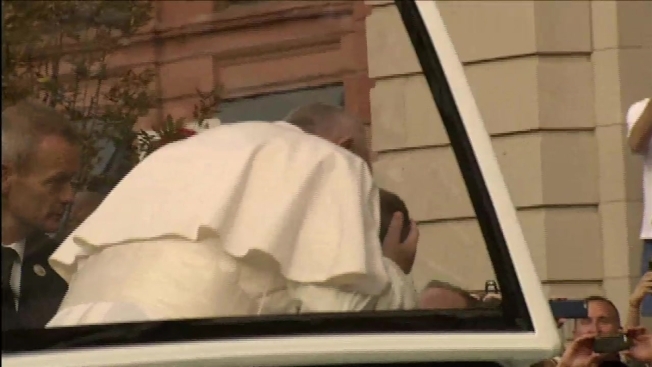 That caught the attention of the pope's security detail as they scanned bystanders. Landon was diagnosed with cancer on his fourth birthday. "He's had a long road for the last 5 years and we're running out of options, and this was a good one," his father said the day after Landon was blessed by the pope. "We were praying and hoping that he [Pope Francis] would bless him, and now it's in God's hands." The Vargas family is planning a celebration of Landon's life on Saturday. You can follow their Facebook page for more information.